The following report, from the commander of the Tornado, was reproduced in the biography of Captain Fry; Life of Captain Joseph Fry: The Cuban Martyr by Jeanie Mort Walker, published in 1875. In conformity with orders received by me, as commander of the corvette Tornado, to carefully watch the coast between Cape Cruz and Santiago de Cuba, I left the latter port on the twenty-ninth of October. On that night I cruised in close proximity to the land between the points indicated, being led to believe by certain calculations, that whatever might be the maneuvers of the Virginius during the night, it was evident that during the day she must lie well off, partly to avoid being seen, and partly to reserve her resources until the proper moment for landing should arrive. During the night of the thirtieth instant, we continued our cruise without incident, and had started on a new course at daybreak next morning, when the man on the lookout reported seeing the smoke of a steamer proceeding in the direction of Jamaica. With a view of ascertaining what she was, and at the same time to save as much fuel as possible, we followed her, hugging the coast for about eighteen miles, when she changed her course to south-east by south. From the first moment that we saw her, there was great activity on board, the whole of the steam power from all the boilers being brought into requisition; and at about half past two o’clock in the afternoon, we commenced to give chase. 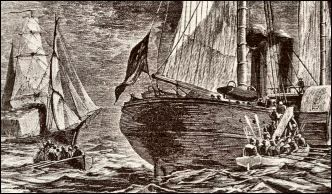 The position and course of the vessel principally, if no other reasons, led me to believe that this craft was none other than the filibuster Virginius; for I imagined that she was proceeding from Jamaica to Cuba when we saw her, but failing under the circumstances to land on the Island of Cuba, she had turned about again for Jamaica. These suspicions were confirmed by her sudden change of course, and the evident activity on board to make all the speed possible, as flames could be seen emanating with the smoke from her funnels. In addition to this, we now saw, by the light of the moon, when she changed her tack, her two smoke-stacks and paddle-boxes. I instructed the engineer to carry on all steam possible, and drive our vessel through the water as quickly as he could. Owing to the darkness, we thought she was about five miles ahead, and hoped to overhaul her before she made Point Morante. At half past nine, while in her immediate neighborhood, we fired five shots, and shortly afterward sent out two boats, under the command of Don Enrique Pardo and Don Angel Ortiz, with orders to take possession of the Virginius in the name of the Spanish nation. The report of these officers has already been made, and I content myself with informing you, that at eleven o’clock at night, the Virginius, flying the Spanish flag, was headed toward Cuba, having on board a prize crew, after we had removed the bulk of the prisoners on board our vessel. The cargo of arms and war munitions was thrown overboard during the chase, but the empty cases fell into our possession, including cartridges and other articles, which are included in the inventory which I have already handed in to the authorities. The enthusiasm of the crew simply baffles description, when success crowned our efforts. The prisoners were treated with such consideration as their character deserved, and the necessity of their safe-keeping demanded. The Virginius, under our convoy, reached Santiago de Cuba on the first of November, at five o’clock in the evening, when our arrival was made the signal of a genuine outburst of patriotic enthusiasm. The importance of this expedition, when the number and rank of the prisoners are considered, cannot be overrated. Upon my arrival in port here, I gave official information of the capture to the authorities, and what must now follow has to be dictated by the officers of justice. In conclusion I have only to add that I congratulate all the officers of the Tornado, from the highest to the lowest, for the severe lesson that they have given to the enemies of our country.